Note: This post was originally published in 2016 and has recently been updated with the 2018 details. 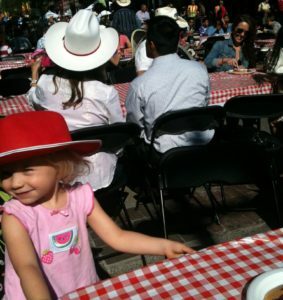 Are you psyched for Stampede breakfasts? As a born and raised Calgarian who moved to the US for university and didn’t return for 16 years, I unapologetically love Stampede breakfasts, not so much for the pancakes and sausages, but rather for our famous Western hospitality. Where else in the world do communities and businesses all over town welcome their neighbours with breakfast parties for 11 days straight? If you hit just one or two breakfasts during Stampede, don’t worry about a little white flour and processed meat. 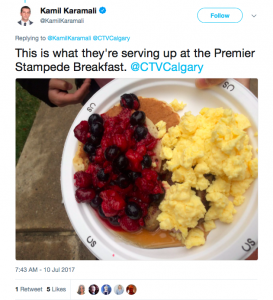 But if you’re a Stampede breakfast fanatic like me, and you prefer more nutritious, energizing food anyhow, it’s out there. Here are eight breakfasts that go above and beyond, offering perks like whole fruit (vs juice), eggs or other protein-rich foods (vs processed meat), whole-grain pancakes, or gluten-free options, for those who need it. Saturday, July 7, 7:45-11am. Free. This was honestly the highlight of Stampede for me last year. There were friendly volunteers galore and they moved the huge crowd through with speedy efficiency. Try something different. You’ll be glad you did! In addition to pancakes, there are eggs and bharazi, a coastal East African dish made with pigeon peas in a mild coconut curry. Pigeon peas are little nutrition powerhouses: fiber, protein, potassium and more. A great (vegetarian) food adventure, and reportedly one of the most popular breakfasts in town, typically welcoming about 6000 people! The community also opens their Jamatkhana (place of worship) for free tours, there will be a special exhibition entitled Expressions of Diversity, and activities for the kids. Saturday, July 7, 9-12pm. Free. 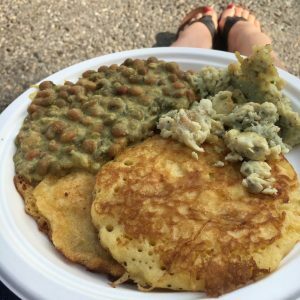 A vegan Stampede breakfast! In Calgary? Yes! It’s actually quite popular. Is vegan necessarily healthier, or more of a health halo? That really depends on what replaces the bacon, sausage, and other animal foods. If it’s mostly whole, minimally processed plant foods, like fruit, vegetables, whole grains, or legumes, you’re in good shape, and they’ve got ’em. Fresh fruit! Whole fruit vs juice so you’ll likely fill up on less and get more fibre. Tofu scramble, which is often much tastier than you might think, depending on the seasonings used. Give it a try! You might be pleasantly surprised. High-fibre pancakes! The first ingredient is sprouted spelt flour. Nice! Sprouted grains are whole grains, and they raise blood sugar relatively slowly (i.e. low glycemic index). The second ingredient is refined/white flour, but the ingredients listed after that give you a nice little fibre boost: Oat bran, oats, ground flax, and chia. Vegan sausages – One is wheat-based and quite high in protein (19g! ), the other is “gluten-friendly”. That’s basically saying “It’s as gluten-free as we can make it, but prepared in a facility with gluten-containing foods, so we can’t guarantee it.” If you have celiac disease, look for truly gluten-free choices like you’ll find at the Calgary Celiac breakfast (below). If you don’t have a medical reason to avoid gluten or wheat, either will do. “Gluten-friendly” pancakes. Again, if you have Celiac disease and really need gluten-free, there’s no guarantee here. I’d go for the (mostly) whole-grain, high-fibre pancakes above unless you have some other reason to reduce (but not strictly avoid) wheat/gluten. Free to members, $5 for others, $10/family. While we’re on the topic of gluten, let’s take a look at the Canadian Celiac Association (Calgary Chapter) breakfast. This is a healthier choice only if you have a medical reason to avoid gluten or wheat. The pancakes aren’t whole grain. 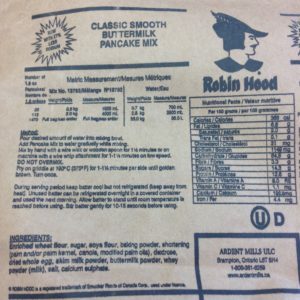 The first three ingredients are pea starch, white rice flour, and cornstarch, so actually deliver less nutrition than the Robin Hood mix below, with similar eye-popping sodium (that’s any pancake mix). Gluten-free pancakes which are also nut-free and prepared without dairy, but they do contain eggs, for those with other allergies and intolerances. Maple syrup — While I’m dispatching health halos, can I just say that I too, love maple syrup, but let’s choose it for taste and maybe patriotism, not the “natural” label. Just two tablespoons give you about an “ideal” day’s worth of sugar, according to the Heart & Stroke Foundation, so a little goes a long way. Omegalicious flavored fish oils, which are come in flavours like peach mango or tangerine zest (! ), sweetened with xylitol, a natural lower calorie/carbohydrate sweetener. I’ve never tried them, but it’s certainly something different. They’re also hosting two surprise vendors who’ll be handing out some samples of new gluten-free goodies, so should be fun if you or a loved one is living with celiac disease. Now that’s my kind of Stampede Breakfast. 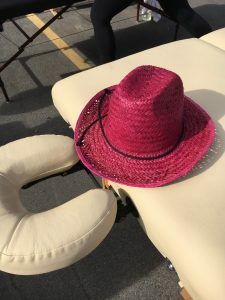 Minimum $3 donation, with funds going to support cancer care and research. Random, I know, but I mention this one because their breakfast is rounded out with a beautiful fruit salad and eggs, done how you like them (!). Yes, they cook eggs to order! If you get there early the line isn’t bad, but later in the morning it can get pretty long. Meanwhile, enjoy the live band and later a chair massage while your kids play games or get a mini-manicure. This will be their 19th time hosting, and last year they raised $3210 for the Rosedale Hospice. Potatoes looked so good I skipped the pancakes. Monday, July 9, 7-9am. Free. I haven’t been to this one, but saw the fruit and eggs in this picture on Twitter last year and thought it should really be on my list. (There are also turkey/chicken sausages.) There will be music from the Cort Delano Duo, performances from The Stampede Stetsons, and of course, plenty of interesting people! $2 or a non-perishable food item, with all proceeds to the Calgary Food Bank. Here’s another random one, but I like that you can get protein from three foods that aren’t processed meat: Roast pork loin, eggs, and beans (with rice). Yay for fiber-rich beans! I went last year and it was fun, but be prepared for a long wait in line. Thursday, July 12, 8-11am. Free. Repsol Place (formerly Talisman Centre). Blueberries! Reheated from frozen, with no sugar or anything else added. Whole-grain pancakes, made with 100% whole-grain whole-wheat flour, a Stampede breakfast rarity. Omega-3 eggs, boosted with (a small amount of) DHA, the type of omega-3 fat found in fish. No, they don’t taste fishy. Smoothies: So refreshing on a hot July morning, and the portion size is small. Chicken apple sausage. It’s lower in saturated fat and sodium than typical breakfast sausages. But it’s still processed meat — frequent consumption is associated with cancer, diabetes, and heart disease, but having it about once a week (or less) appears to be fine. Lite syrup, which has about half the calories and sugar, but with a pretty ugly ingredients list, as is typical for any pancake syrup that’s not 100% maple. It’s not clear that actually makes a difference to health outcomes (sugar is sugar), but I’d skip it and top it with the blueberries instead. I’ve never been to this one, but we might try it this year. I can’t tell you what you’ll discover, but they say it’s “a variety of ethnic foods served up by restaurants on International Avenue”, so it’ll be more than pancakes and sausage anyhow. Also, men over 40 can stop by the MAN VAN and get their numbers checked — PSA, blood sugar, blood pressure, etc. What if you just prefer to hit your neighbourhood breakfast, but you want a healthier start? Consider eating before you get there. 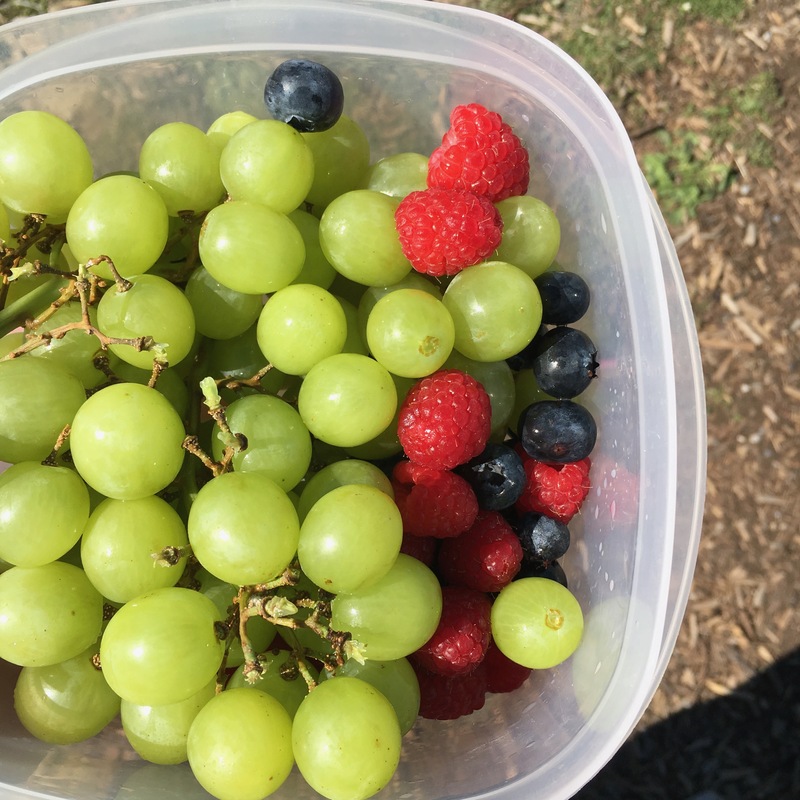 Or bring along some berries, almonds, or pumpkin seeds. Mandarin oranges travel well. Toss a hunk of cheese in your bag so you can skip the sausages and still have protein (plus bonus calcium). Want to bring more? Download my list of 15 heart-healthy on-the-go snacks. 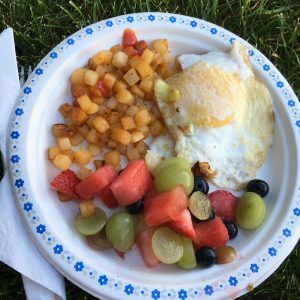 If you’re looking for a breakfast in your neighbourhood or on a certain day, check out this comprehensive listing of festivities. Half the fun is the entertainment and socializing anyhow, and this way you can skip the long, hot line and just enjoy the party. Yahoo! If you know of another breakfast that should make the list, let me know. 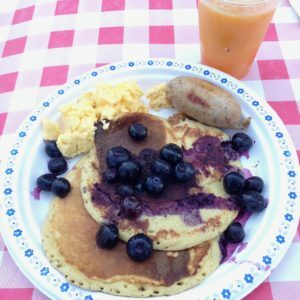 Curious about what’s in typical Stampede breakfast pancakes? This was used at a big community event I volunteered at. 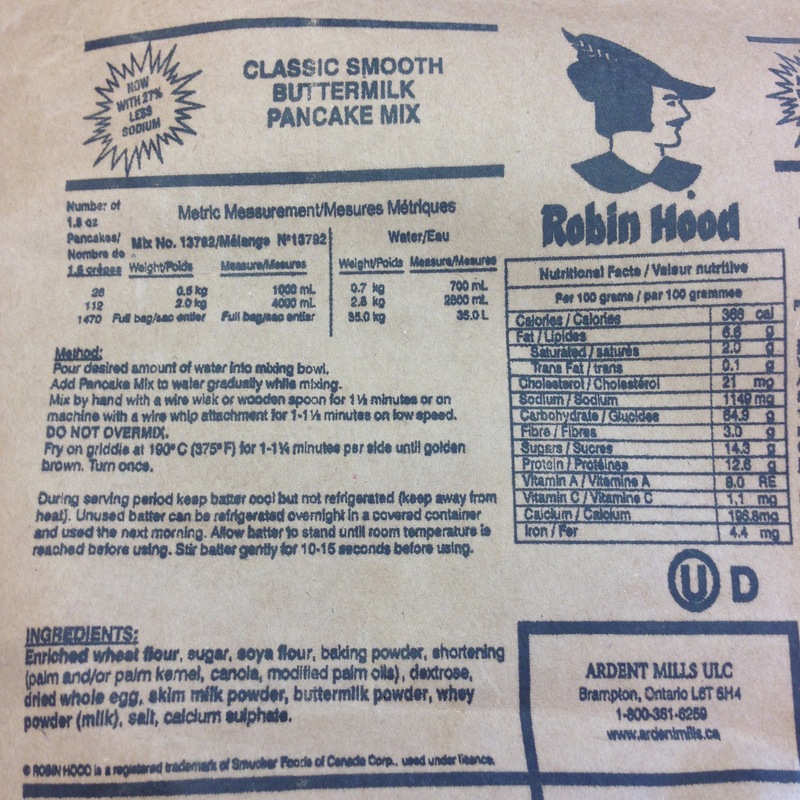 Nutrition facts are for about 5 pancakes. Trust me, I hate spam too. Is there any heart-healthy(ish) food at Starbucks? 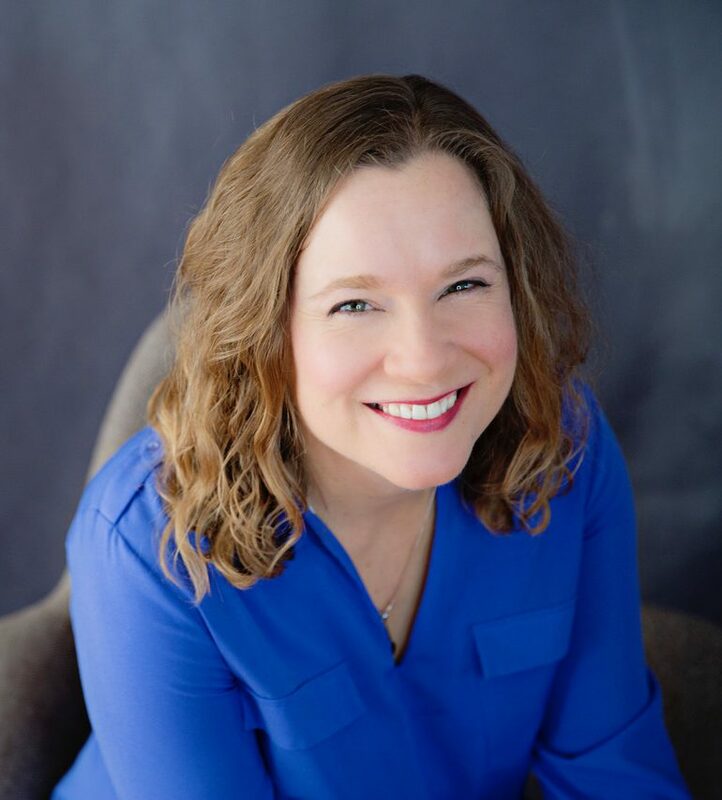 Copyright © 2019 Sweet Spot Nutrition - All rights reserved. Information on this website is for general knowledge only and not meant to substitute care from a dietitian, physician or other healthcare provider. Subscribe to my weekly updates. 15 delicious, heart-healthy, convenient ("sweet spot") snack ideas. You'll also sign up for my sweet spot eating tip of the week. You can unsubscribe anytime.